Excepting the noisy ATV riders who frequently transit the area, Greenbrier State Forest in southeastern West Virginia is a largely quiet and peaceful destination for hikers and mountain bikers. Spanning the flanks of tree-covered Kates Mountain, Greenbrier is not known for its spectacular vistas; however, it does offer 13 miles of hiking trails that crisscross the preserve. The Old Field Loop—by no means the park’s longest or most scenic—nonetheless offers a pleasant, 1-hour jaunt, a nice destination for an early morning stretch or an after-dinner walk for those staying in the park’s cabins or camping area. 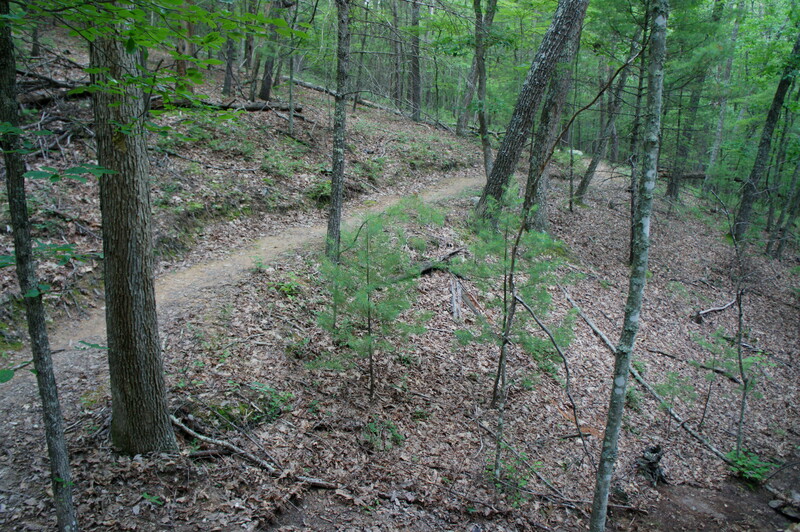 Two different trails take off from the parking area: the Holler Trail follows an old road northeast to the picnic shelter while the neighboring Old Field Loop Trail dives into the woods to the right. Taking the latter route, the trail immediately forks, the start of the 1.8-mile loop; take a right for a gentler climb. The bulk of the infrastructure in the park is situated in a valley between Kates Mountain and White Rock Mountain, but the Old Field Loop after 1/10 mile begins to gradually ascend partway up the western flank of Kates. The climb is a bit unusual, comprising six seemingly unnecessary switchbacks—slowly meandering up the mountain when blazing straight up the hillside would probably not be an insurmountable task. 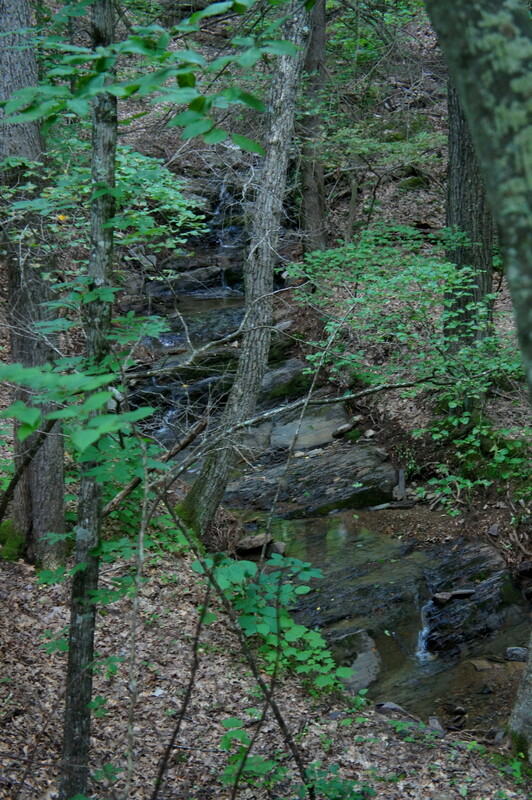 The advantage is that hikers can tirelessly enjoy the scenery: relatively young woods with a paucity of undergrowth. Towering oaks form the top of the canopy, while rhododendrons, chestnuts, and Virginia pines fill the space in between. 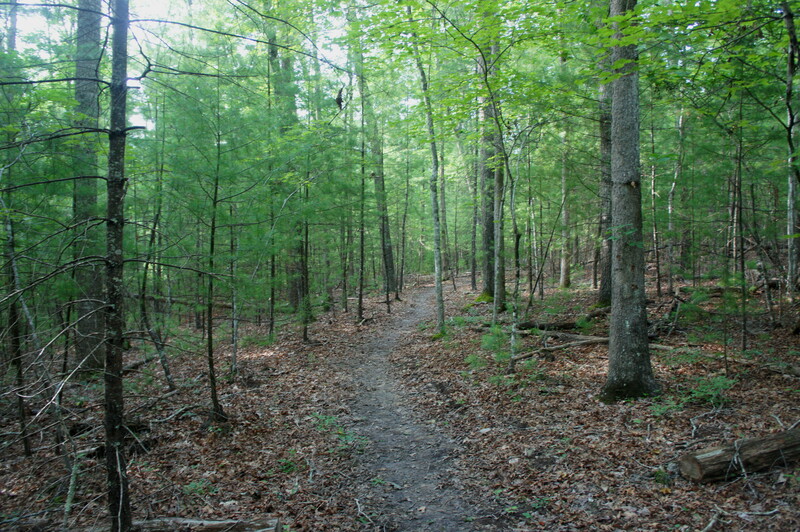 As the trail climbs, the evergreen pines become more prevalent, and the trail crosses the grassy Old Field Road at around ¾ mile. (Note: At about 7/10 mile, just before the road, stay right at an unmarked fork; the social trail bearing left is—probably intentionally—blocked by fallen logs.) The trail beyond, sporadically marked with turquoise blazes, becomes more interesting as it thrice approaches a deep and relatively narrow ravine often bearing trickling water. 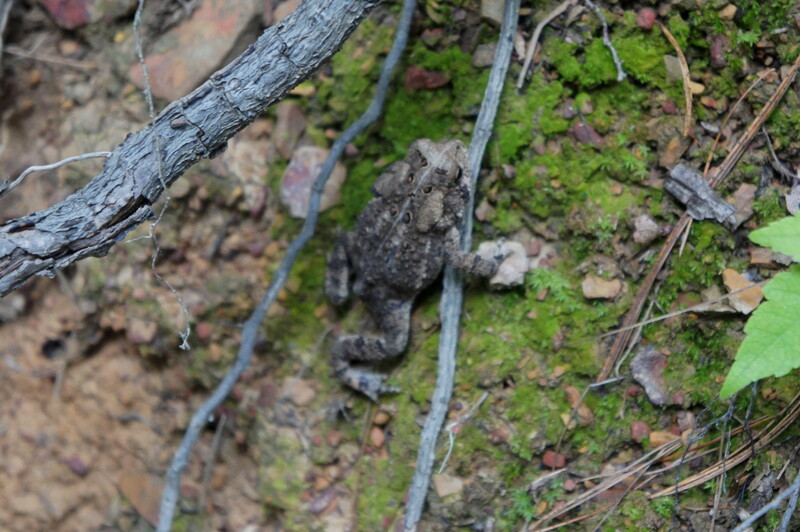 Those with a careful eye may spot tan-brown American toads. One mile from the start, the trail finally turns away from the ravine, leaving it behind as it bears northwest along the hillside. At 1.1 miles, the trail crosses another old road, now overgrown with green grasses. Minutes later, the trail crests a high point, then drops again to skirt a minor ravine, followed 1/10 mile later by a second. Now bearing north, the footpath gradually descends to another trail fork. Again the route bisects the Old Field Road; stay straight. After the junction, the declivity becomes more acute, but it is far from knee-buckling. Weaving back toward the trailhead, the route enters a fern-covered ravine at about 1.4 miles and passes picnic shelter #2 on the right. From here it’s a short jaunt back to the initial trail fork and parking area, completing a short but pleasant loop in an oft-forgotten corner of an oft-forgotten state. Allow around an hour for this moderately difficult hike. 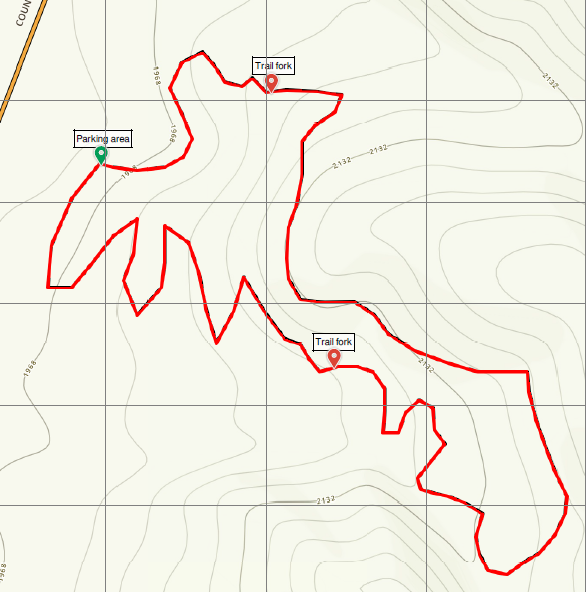 This entry was posted in Greenbrier State Forest, Moderate Hikes, West Virginia and tagged Greenbrier State Forest, Kates Mountain, loop hike, Old Field Loop, West Virginia. Bookmark the permalink.